Healthcare professionals who create and develop their own health app often miss key elements when it comes to producing their application. This means they forego opportunities to speed up development time and make their app play well with other apps. 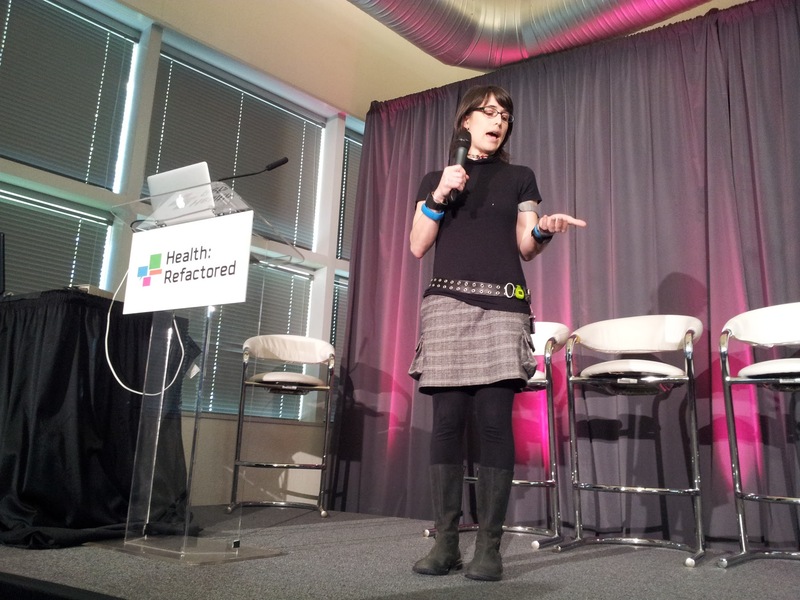 We recently attended the Health:Refactored conference where this topic was highlighted. Below we’ve distilled some of the key messages shared by leaders from Microsoft, Allscripts, FDA and more. 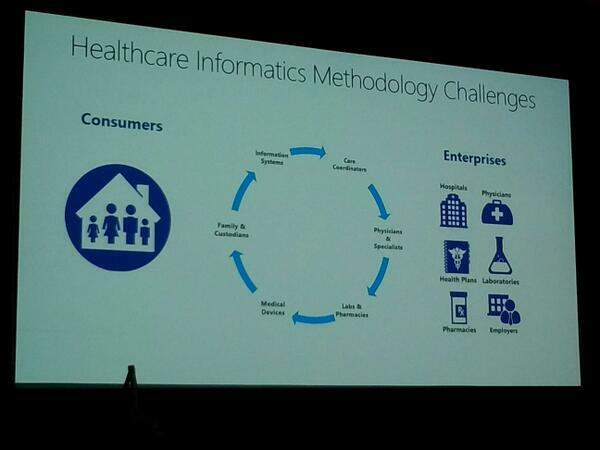 Sean Nolan (@familyhealthguy), a Microsoft Distinguished Engineer and Chief Architect who heads Microsoft’s Health Solutions Group, praised platforms as the way to cut development time and costs. How do people learn about your solution? How do you get the data you need for your solution to work? How do you provision people’s identities? What platform do you choose? Nolan notes that not everyone has an iPhone, which traditionally has been reserved for wealthier clientele. How do you ensure ‘any’ patient can use your solution? How do you ensure ‘any’ provider can use your solution? How does your solution communicate back to providers to impact care? Where and how can payment happen? Nolan notes that the reason a lot of start-ups and initiatives at universities stall is because they try to focus on those aforementioned questions too much when they could have other companies solve these problems for them. 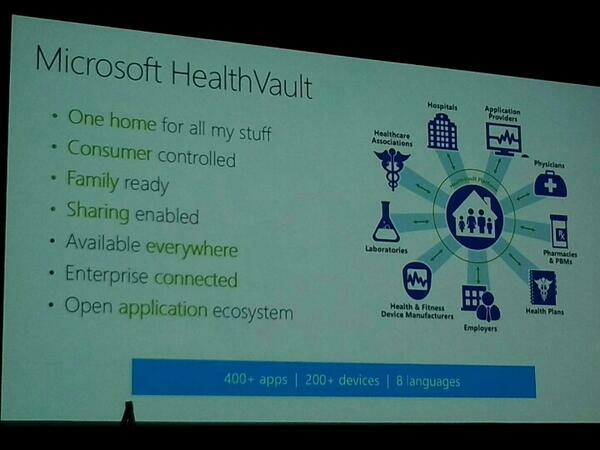 It is worth noting that throughout this conference, Microsoft aggressively marketed their HealthVault platform to the attendees. Rachel Kalmar (@grapealope), a data scientist at Misfit Wearables, conducted an experiment for several months wearing multiple body sensors to see how much her health could improve with these devices. Kalmar found that, to her dismay, all of the devices couldn’t operate together and that she couldn’t access the data. She believes, however, that since the consumer health tech industry is still in a prototyping stage creating different devices and apps, it may be too soon to demand that devices operate together. Why? No standards exist yet because the functionality is still evolving at a rapid pace. Kalmar feels that building clear API’s and documentation is an interim measure while the industry decides what to do with standards. Kalmar also asks, “How can [companies] balance being competitive with being open?” There are various ways to be “open”. pay-per-API call – Google does this. reciprocal data sharing – Jawbone does this. However, it’s harder for newer developers and companies to reciprocate data sharing if they have little data to offer. free API access to trusted parties. build a platform – similar to RunKeeper, Google Play, and Apple Store. Useful if the developer already has traction. open data share & share-alike license – like Creative Commons. completely open – companies pursuing this will have a more difficult time in the future to monetize their business. Kalmar recommends attending various meetups, like www.meetup.com/Sensored and www.meetup.com/HardwareStartupSF , to further find solutions to this problem.